At the UKCAA @ Huddersfield event, one of the HDMAC members brought along a very nice epoxy glass fuselage - already primed. After some deliberation, it was established that it was a Touche a very elegant design reminiscent of the Aurora. 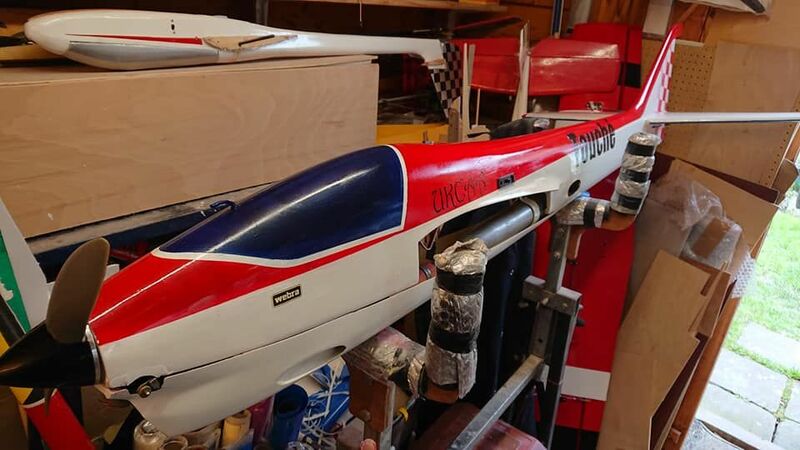 So for the princely sum of £25 I bought the fuselage but with no drawings or plans to go with it. From a FB posting, I was put in touch with John Palmer who provided me with some sketch drawings, followed soon after with some better scans from a kit that Andy Green had. 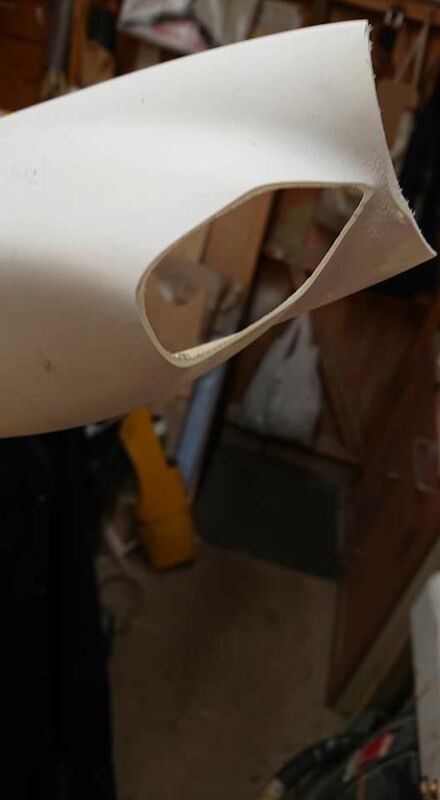 Glass fuselage and Foam wings. It must be ARTF. 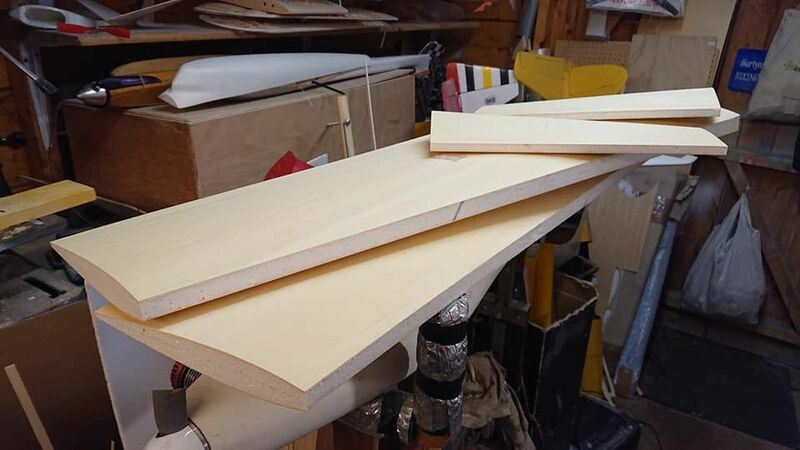 With that info, I ordered a set of wing and tailplane cores from Bill Manley (Bil Kits) and made a start on the fuselage. 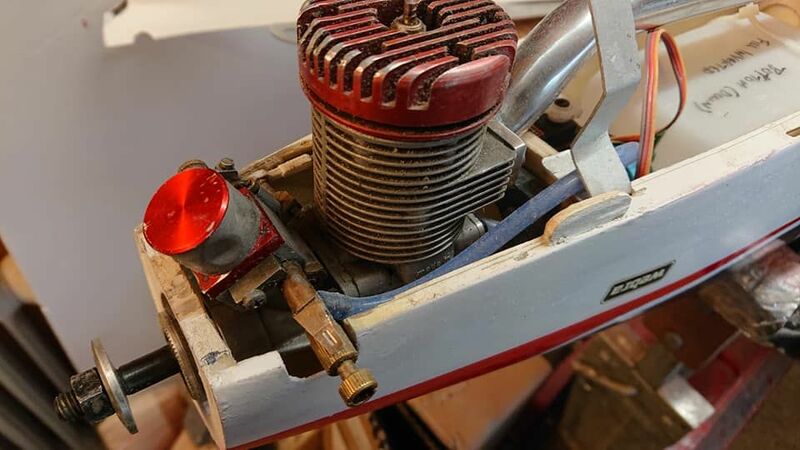 Now, the idea is to build this while glue is drying on the Fury and the Rearwin Speedster, so updates may be a little slow. Power will be a pumped Webra 61RE Redhead on a pipe (of course) that I used in my Magic which got decommissioned a couple of years ago. The first task is to get the firewall into place. The template that Andy scanned for me gave me the outline but the first major problem is that there is no obvious datum to measure from. 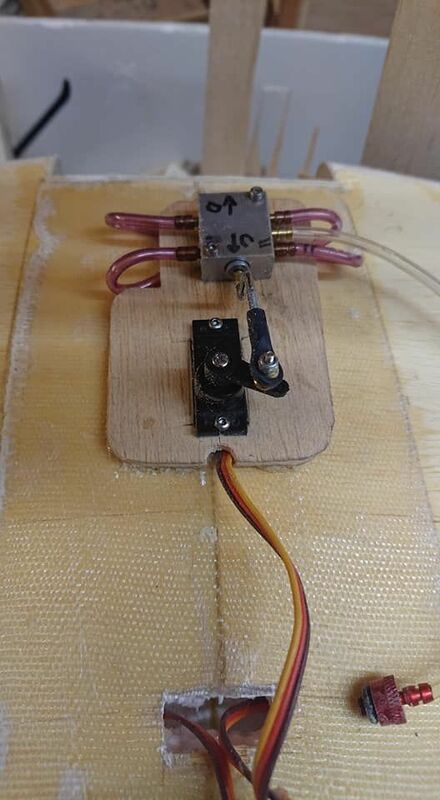 The drawing says 3 degrees right thrust and 1 degree down so the former was marked up, drilled and the nylon mount fitted. 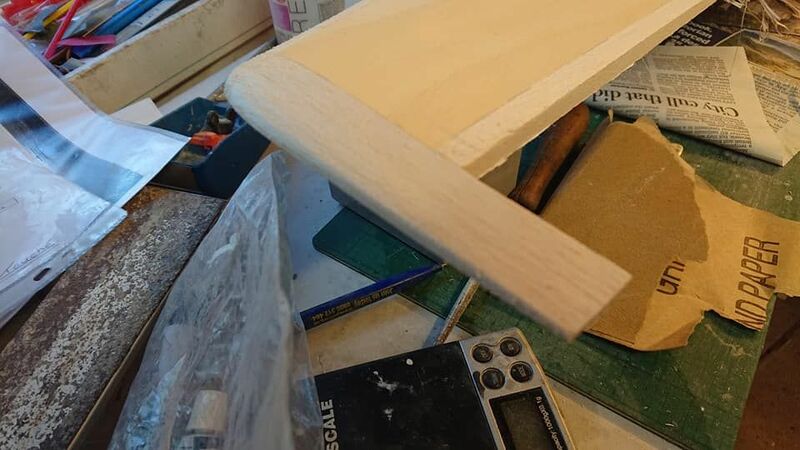 The only thing that I could use was the vertical (I hope) LE wing seat to measure from so with a piece of wood as packing (to clear the flange) the location of the former was very carefully measured and skewed and tilted to compensate for the down and side thrust. 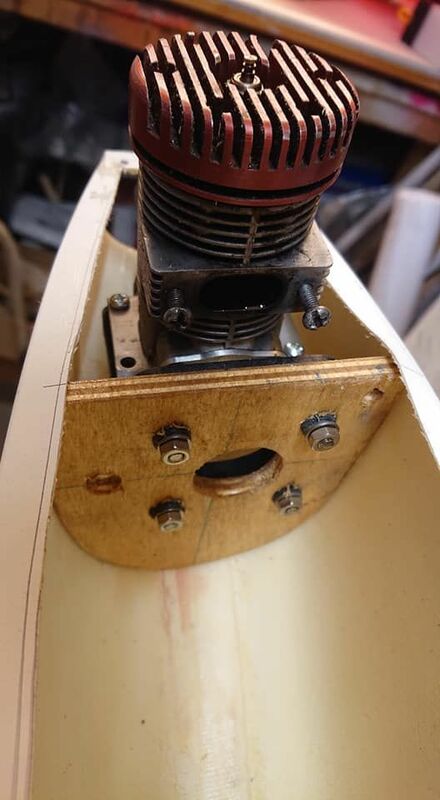 The engine is fitted so that I can check the alignment at the nose ring. When happy, the firewall was epoxied into place and allowed to set. With a spinner fitted and a 2mm adjustment in height that doesn't look too bad. These have a lock nut and washer on the back. 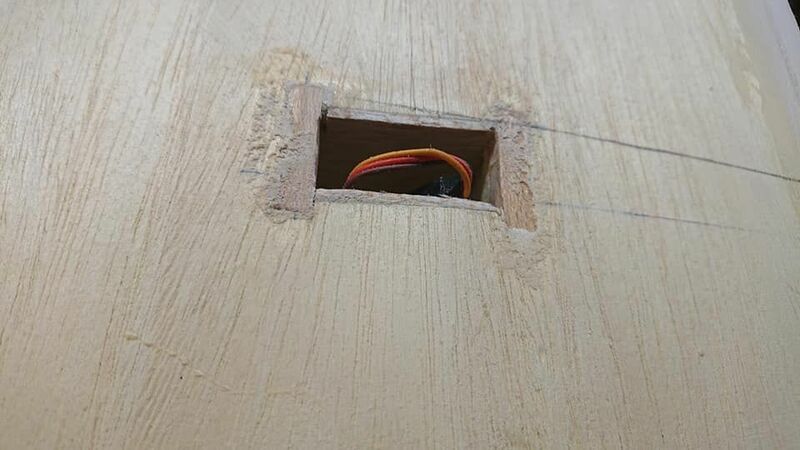 You can see the small gap between the mount and the firewall. 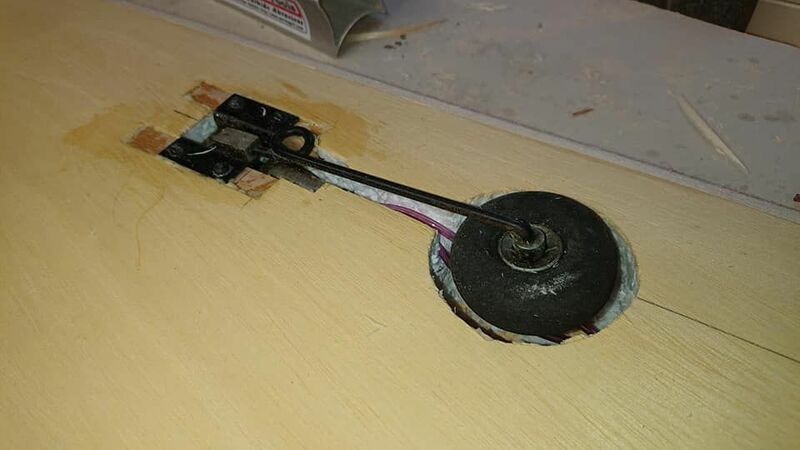 This is a sort of poor mans soft mount. 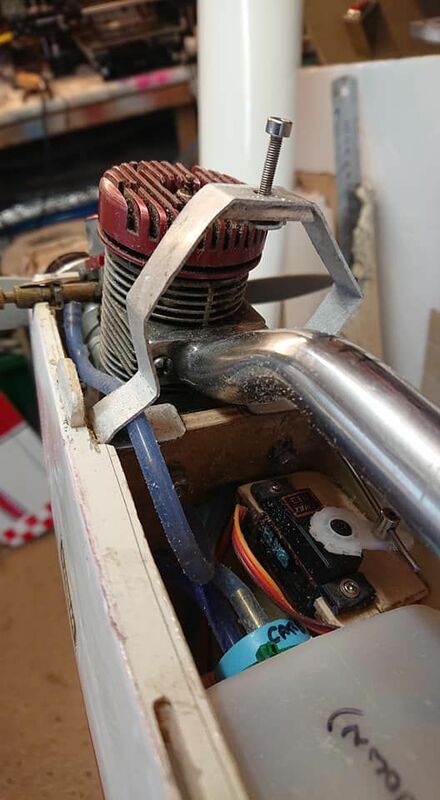 It certainly seems to work on my Mama Mia and helps isolate the engine from the fus - hopefully keeping the noise down. 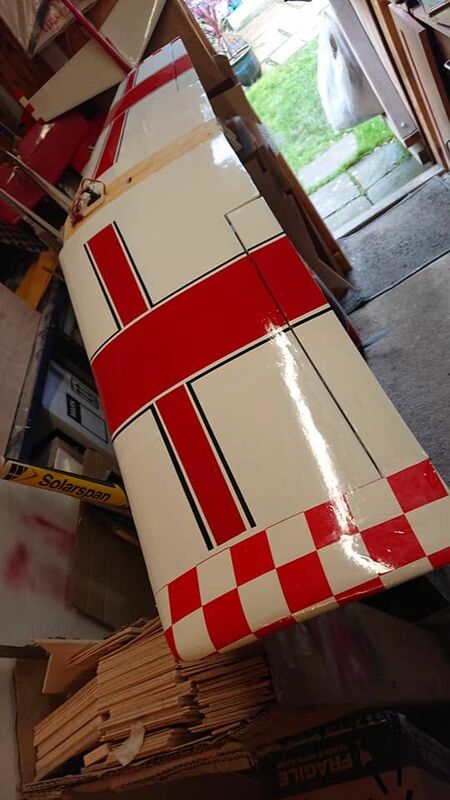 Last week the wings and tailplane arrived from Bill. I have to admit that these are some of the nicest foam panels I have ever seen. Perfectly finished and a quick check on the sweep back showed they were perfect. 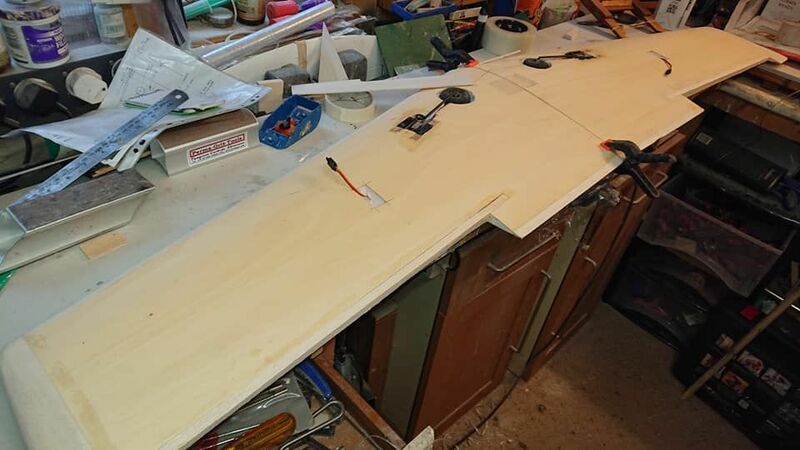 The fuselage was put aside while I made a start on the tailplane. 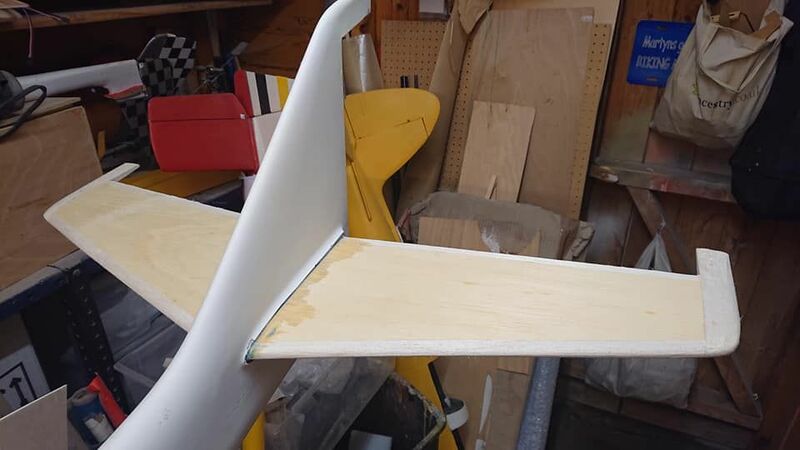 The wings have also had the LE and TE fitted and sanded to profile. Very nice! Was this a pre-turnaround design? Was there ever a plan for this one? It doesn't look like it will take too long to put together, either. You've probably seen this already - Hobbyking sell all the air retract clobber for very little cash. I think I priced about £20 to get all the bits needed (I picked up a set of second hand spring air Robarts a while ago). What are the beech bearers for? 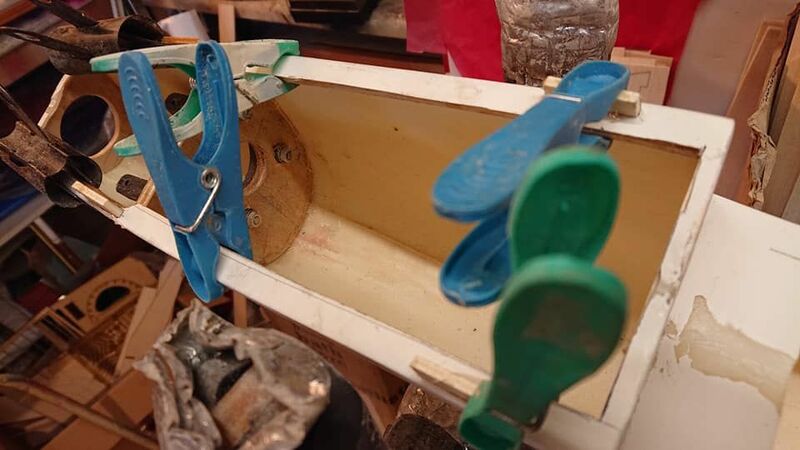 If it is the retracts, do you think the ply + dowel method would be worth using - it seems a stronger set up? I hadn't seen that HK link. Many thanks, that's very helpful. 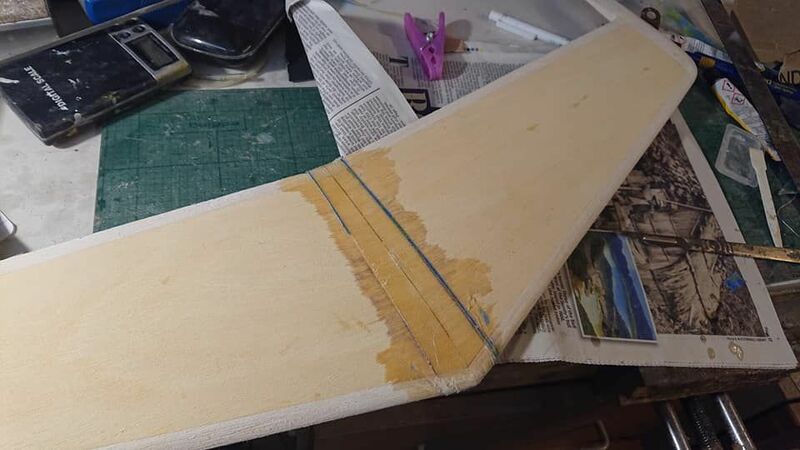 Beech bearers will be for the retracts, I am not aware of the ply/dowel method, can you let me have some info on that please? 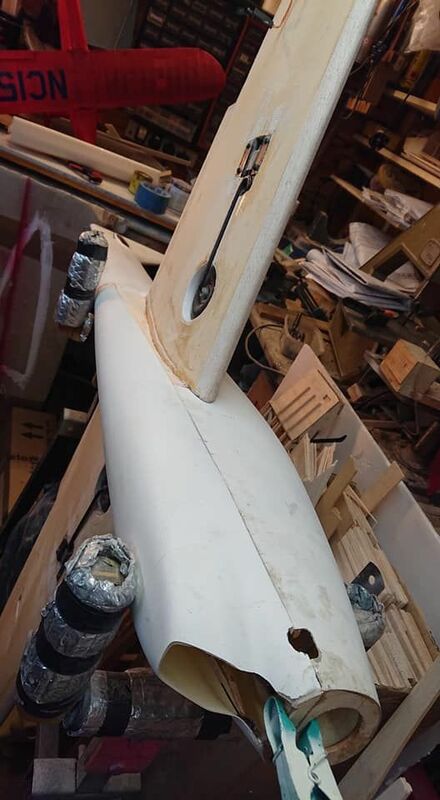 A bit more work on the fuselage. 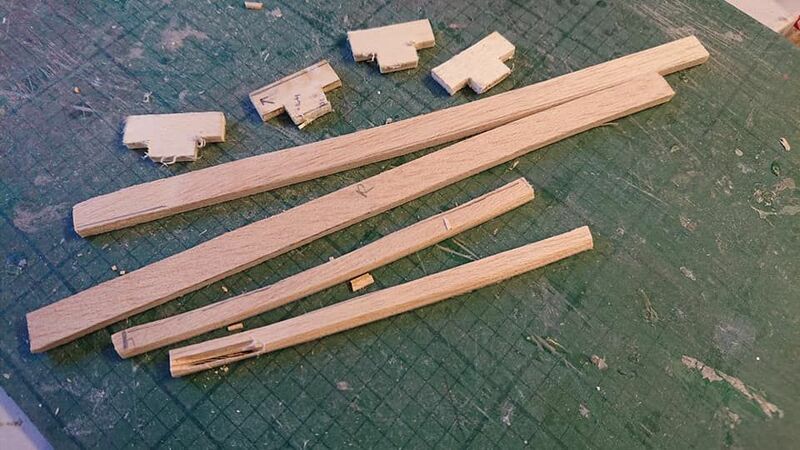 3mm ply reinforcement for the wing dowel locating peg. 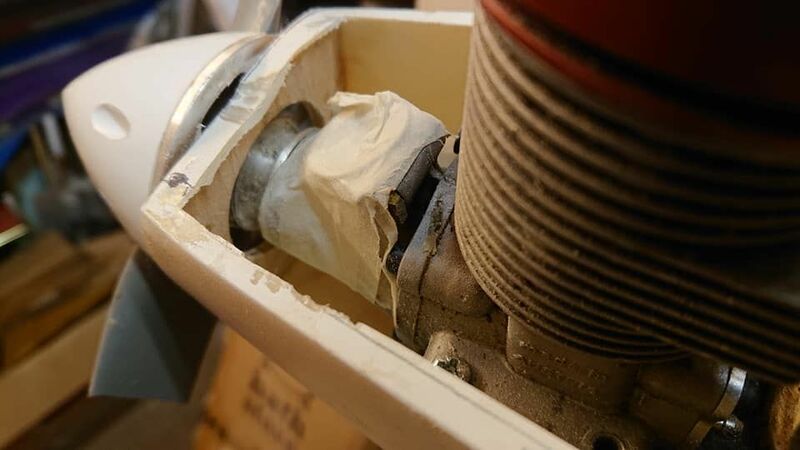 The original used a 3mm ply plate in the wing slotted into this, That is still an option. I have also added a couple of enlightening holes. All these grams help.. 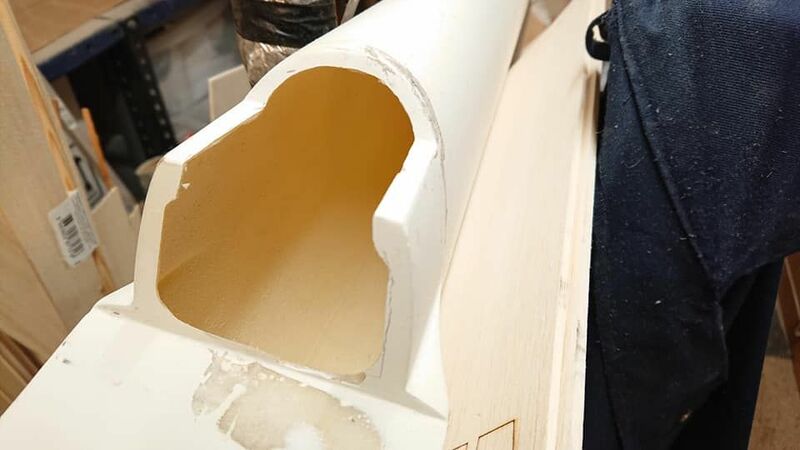 The little curve at the top is to get round the seam where the two halves were joined together. The front of the belly pan after about 30 seconds on the disk sander I really like the air intake shape that has appeared. Reinforcement disk at the rear of the belly pan. 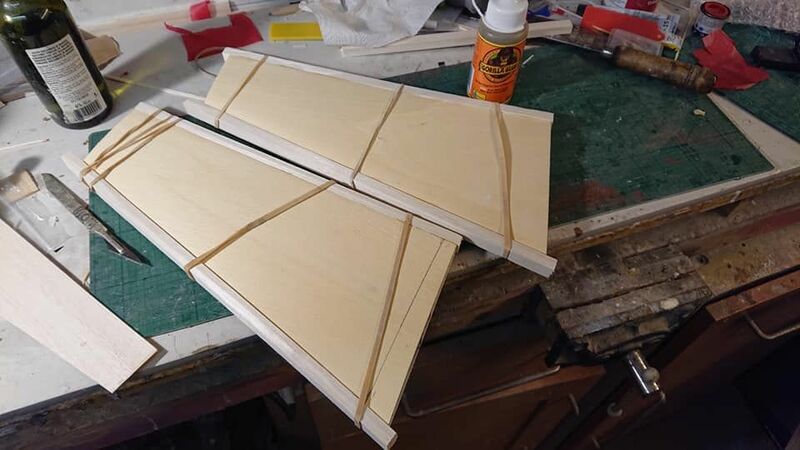 This will be located with a couple of steel pins, I'll probably use panel pins..
Two rails sit in front of the wing two under the wing. 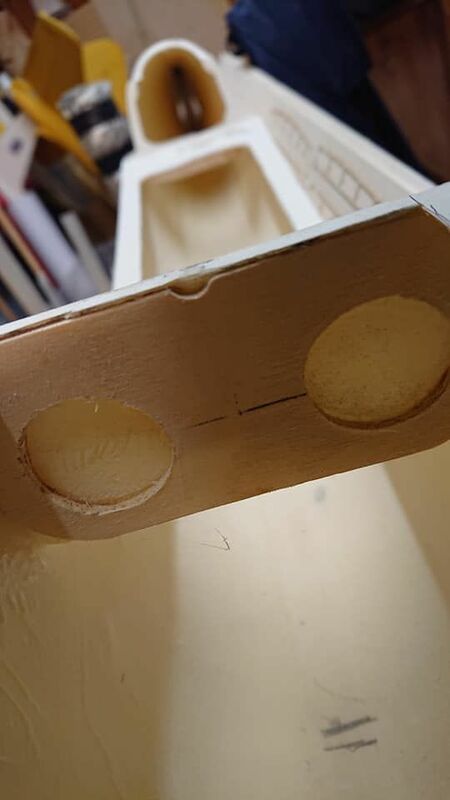 The play rails are slotted then glued into place. 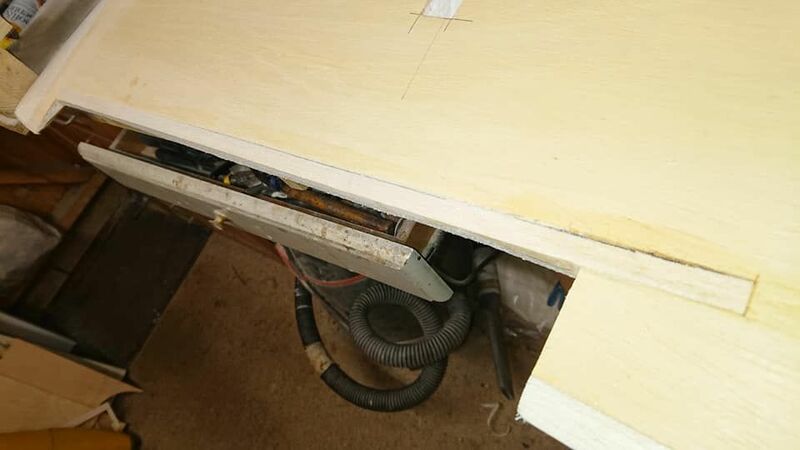 The dremel with a diamond cutting disc was very useful here..
With the tabs fitted and sanded slightly - needs a bit more work yet. 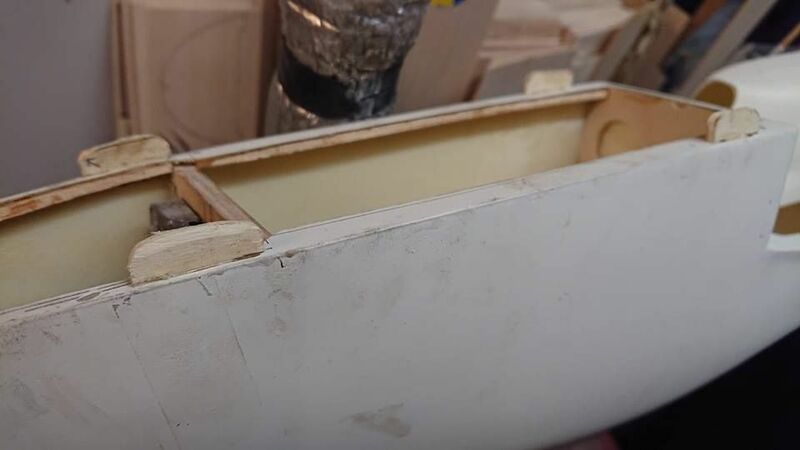 Next job will be to fit tabs in the belly pan, but I haven't fathomed out from the drawing how to do that yet. 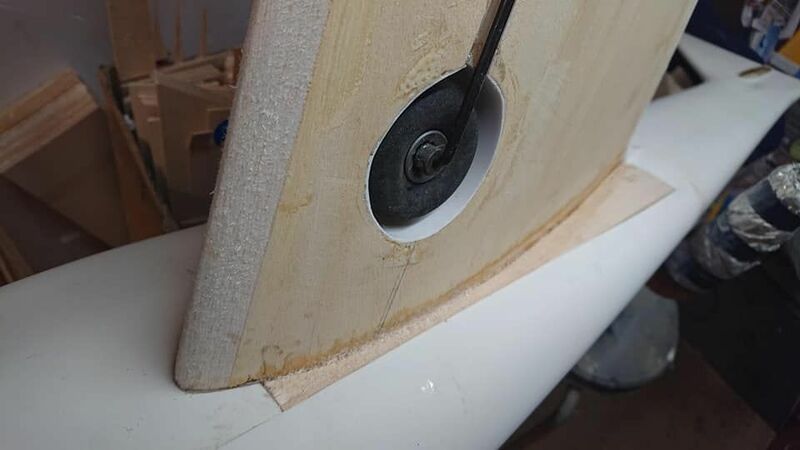 If this is what I am thinking that you are trying to do with a ply plate then do not dowel it in. 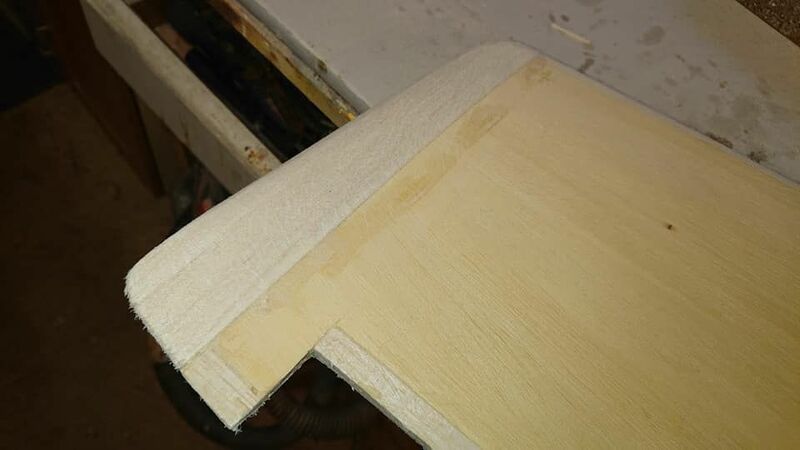 In the event of a hard arrival a plate by itself will just rip out and is easily glued back in. 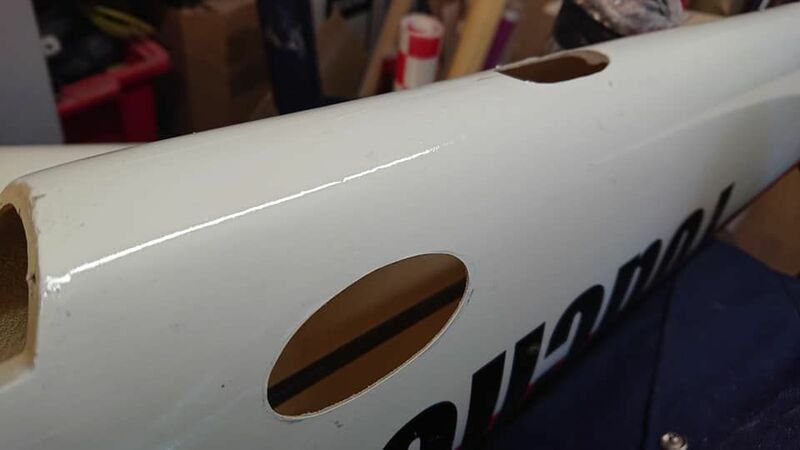 With dowels it would wreck your wing. I know this from bitter experience. 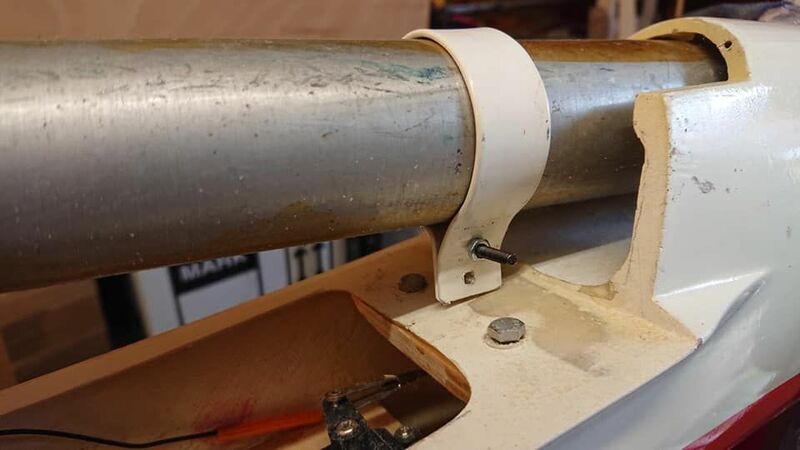 How would you mount retracts in a foam cored wing Martin? 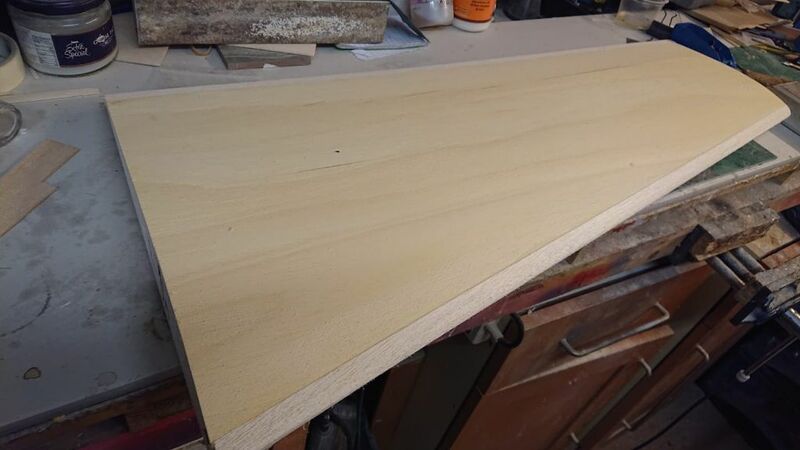 Martyn the ply method is straightforward enough. 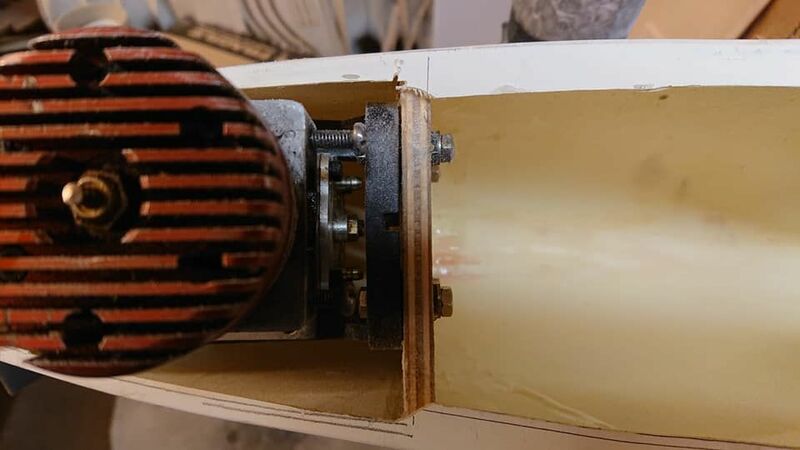 Cut a ply plate about 2x3. 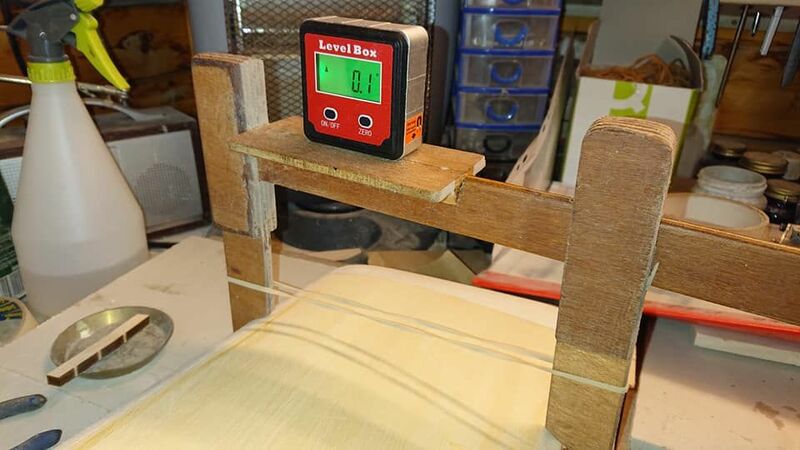 Six lengths of quarter inch dowel are glued to it at right angles. After drilling suitable holes of course. 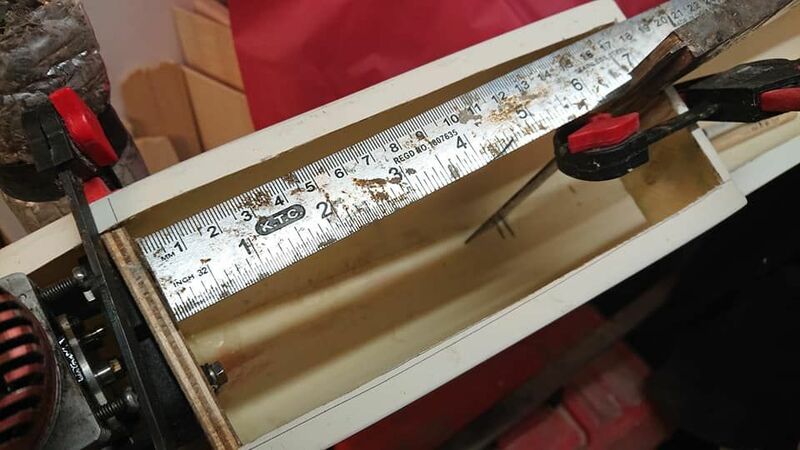 Dowels are about an inch or so long. The retract mounts to the ply plate. Plate is sunk into wing surface. 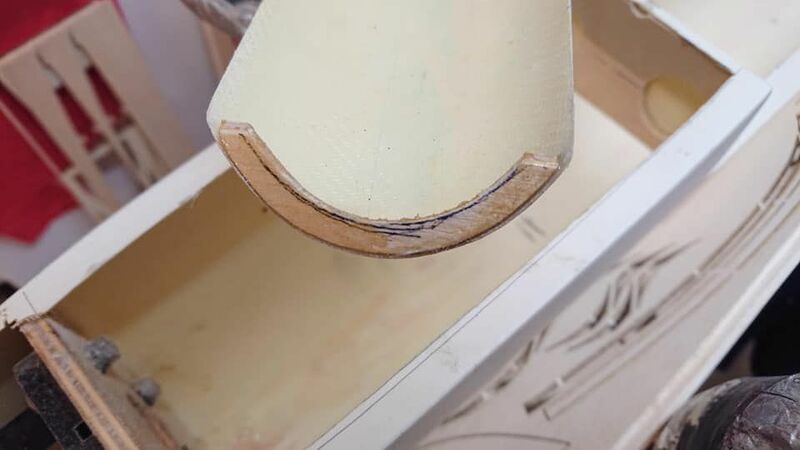 The dowels poke into the foam. They simply provide more anchorage for the plate. 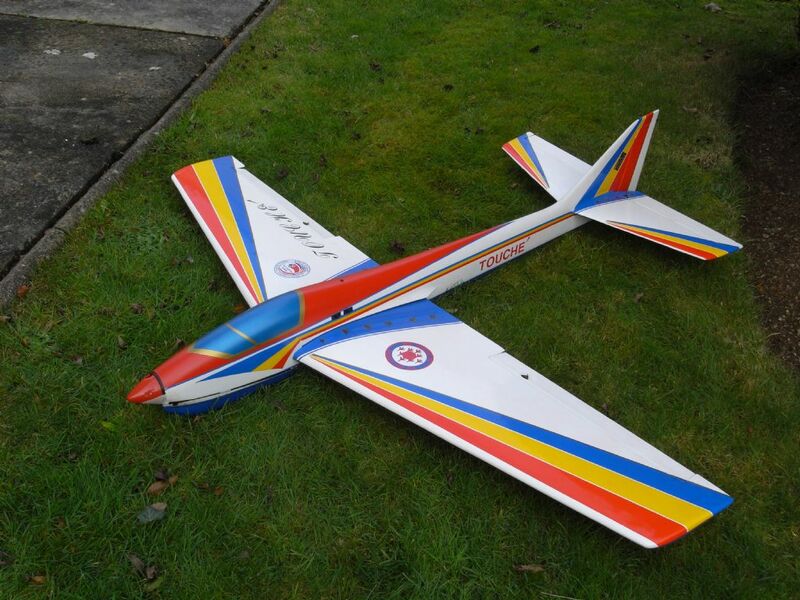 Martyn, not sure if this is of any use to you but here is a photo of one my father completed but never got to fly. So nice to see these classics being kept alive. That looks really nice. That colour scheme makes it look very much like the original Naruke Aurora. How are the retract mountings coming along? looking forward to seeing some pictures of these. 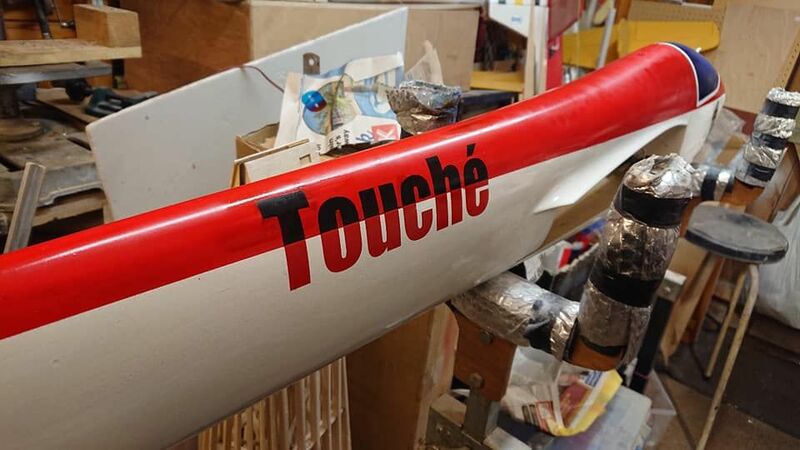 Regarding the finish on his Touche, I came back to modeling around two years ago and one of the things which sticks in my mind that my father said, he built models for more than seventy years and always strived for perfection, but this was the one thing he regretted doing. 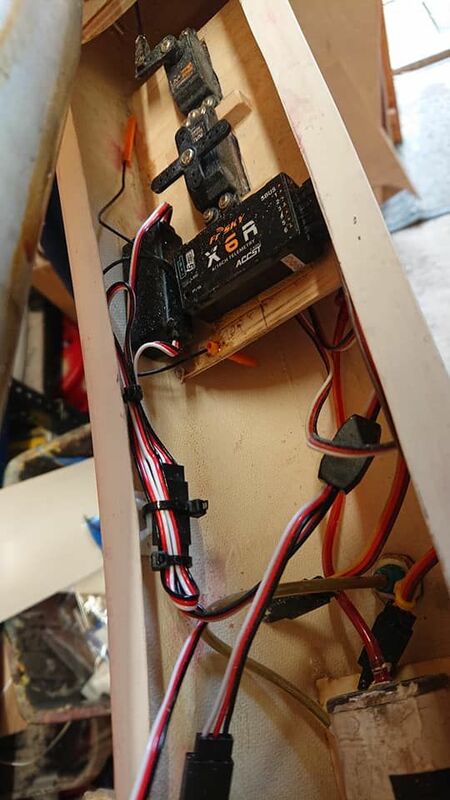 His advice to me was that it does not matter what they look like on the ground, its how they fly that counts, build as best you can and don`t worry about imperfections. Sorry but I haven't made much progress in the past few days. I am still trying to get the retracts working. The air line that I ordered is too small so I need to get something just a little larger. Anyone know what size airline I need for rhom Air retracts? 1.5mm id is too small. I can get 1.7mm from hk. The brass tube fittings are 2mm od. They do not give the air line sizes unfortunately but they do show that the air lines have a 1/8" wheel collar around them to help control the speed of operation, so that should give you an idea of the external tube size but Im not sure that helps much. Thanks. I do actually have the manual. As you spotted, no info on the size of the pipes. I do have a couple of short lengths of the original pipe and it is 3mm od. They plug into 2mm brass tube. The instructions say they have to be heated slightly then stretched into place. I couldn't get the 1.5mm id to stretch far enough so have ordered some 1.7mm pipe from hk along with some couplers and other bits as spares. They won't be here for another week or so though. 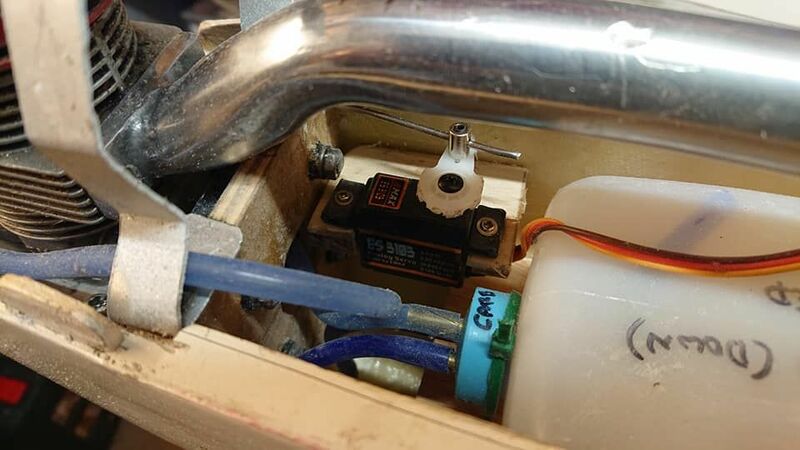 I`m pretty sure that the Rom-air units I used to use had very small i/d tubing. Very tight and needed soaking in hot water first. I should have some unused HK stuff. Will have a look and measure it tomorrow. I have 2x 5ft of transparent and an unopened twin pack from HK. They fit Rom units and are about 1.7mm (more likely 5/64" . Remind me of your address if you want either. The transparent is best. Trying to get away from air retracts so these are surplus. Glad to hear that you are recovering. I gave up on those Rom up/dn air valves a long time ago. 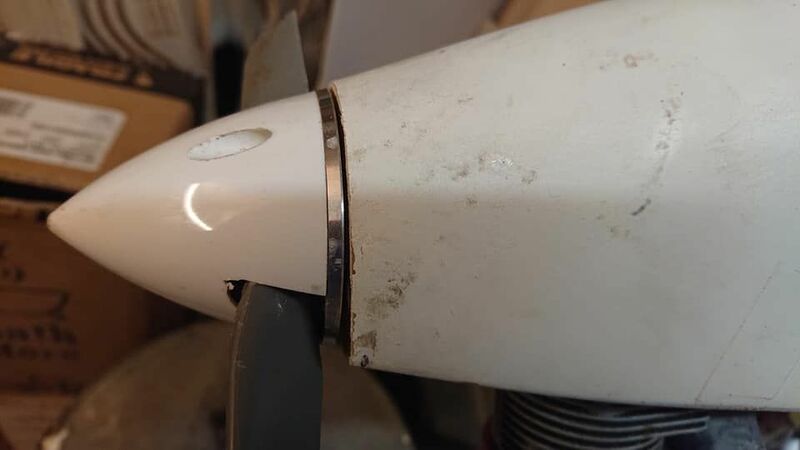 Seem OK on the ground but leak when vibrated. The red anodised HK ones actually work, as do their blue filler valves. Cannot remember what your fus. is covered with, but I always add a coat of 20% dope just before painting. This seals the dusty surface and prevents the masking from lifting the primer or paint (usually).